Special talks have been taking place between America and Russia about taking international control of Syria's chemical weapons. The US Secretary of State John Kerry said talks with his equivalent in the Russian government, Sergei Lavrov, had been "constructive." America and Russia have had very different ideas about how to respond to the suspected chemical weapons attack that killed hundreds of Syrians in Damascus last month. 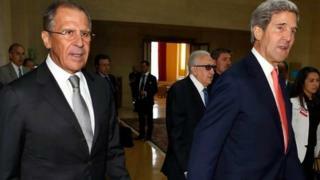 But after the Syrian president announced on he was willing to hand over the weapons on Thursday these talks are seen as the next step in achieving a peaceful outcome to the current situation in Syria. The talks are expected to last until Saturday. For more on the background to the Syrian crisis click here.